Peersonic can replace the cells that power Biotrack radio TX tags. Peersonic are experienced in microscopic repair of electronics. As a result, some users of non-Peersonic equipment have asked Peersonic Lab's help with replacement of micro cells in bat radio tags. We have discussed with the original manufacturer, and it is agreed now that Peersonic can do this without causing commercial conflict with the original manufacturer. For full details, contact Peersonic. This has been cleared with Biotrack. but as it is a recovery service, there is no guarantee from Peersonic, and no backup cover from Biotrack. The service has been tested and proved for Biotrack 173 Mhz tags. The procedure needs to work in batches, this then has an impact on the turn round time. 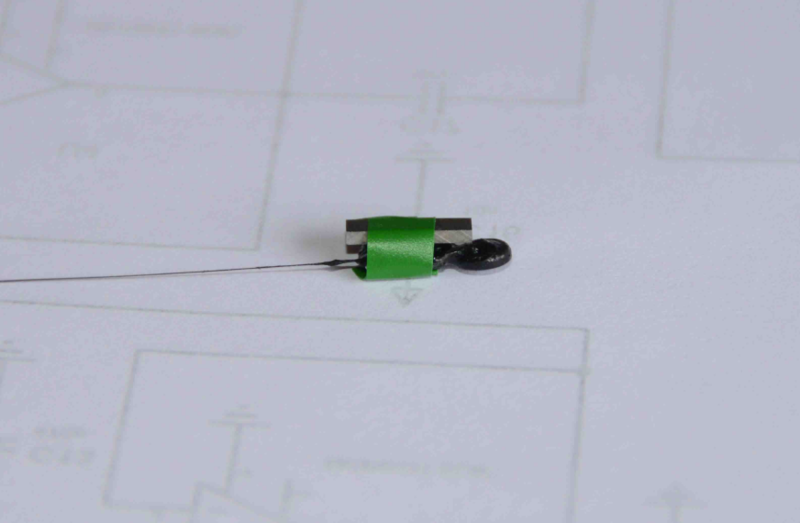 Tags are initially stripped and cleaned of conformal coating. The dead cell is manually removed and a new cell fitted up with micro connectors and soldered in place. Then the tags are re-dipped and dried in a magnetic field to prevent battery leakage during the curing process. Contact Peersonic and return your expired tags with payment of £10 per tag. Avoid returning tags that you already feel have seen bad times or have been re-batteried more than three times ( as a guide). The process looks reliable, but as no reliability figure can be put on that, any tags that do not survive the operation will be binned. If you want to see the dead tag back, There is an initial up front charge of £3.50 for the returned evidence. For the rebattery work a weeks leadtime is reserved. Finally, fully tested tags will be returned for a charge of £30 plus P&P at £5.00. In order to proceed please contact Peersonic for a proforma invoice. When returning tags – PLEASE INCLUDE THE MAGNET otherwise there would be a charge for new magnets, yet to be estimated. So in summary the total cost of a fully successful operation is therefore £40 plus VAT = £48.00. Delivery is extra but these items are so small that one box can hold 1..20 at £5.50 inc VAT. P&P costs are estimated at UK only.